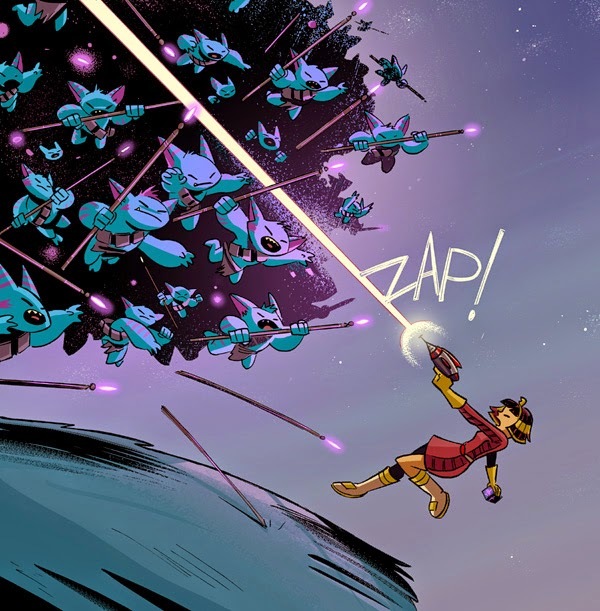 I am thrilled to be a stop on the book tour for Kids Comics Q&A Blog Tour, held in celebration of Children’s Book Week hosted by MacTeen Books (co-sponsored by Children’s Book Council and Every Child a Reader and the Comic Book Legal Defense Fund)! Today, I have an interview for your reading pleasure, but be sure to check out the full tour schedule by clicking the banner above! 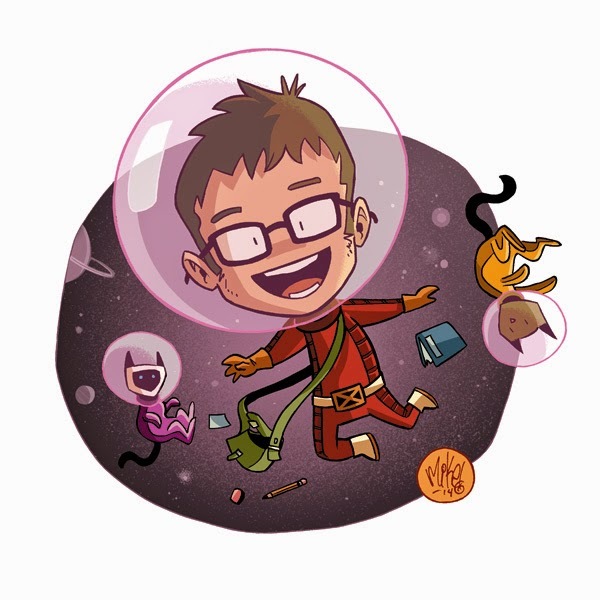 Mike, thanks for taking our questions. It's a pleasure to cyber-meet you. Rafael lives in Columbus. Jorge was born and raised there and you went to Columbus College of Art and Design. Lots of cartoonists seem to be from Ohio: Jeff Smith, Paul Pope, Billy Ireland, the creators of Superman and on and on). Do you think there's something about that Midwest that encourages or creates cartoonists? And what was your experience at CCAD like? I dunno. Maybe there’s something in the water. Or maybe it’s the pizza. Yeah that makes sense. Ohio has really great pizza so that must be it. It encourages us to keep working instead of taking the time out to cook dinner. And the cold weather keeps us indoors. Now I live in Florida which contains neither cold weather or good pizza and I can feel my creativity depleting by the hour. And CCAD was a tough school. A good one, but a tough one. Lots of drawing. Lots of coloring. Lots of studying. Lots of all-nighters. I don’t know if it’s still that way or not. I went at the turn of the century when animation studios stopped animating traditionally and the internet had barely scratched the surface of the artistic community it is now. Now you can learn stuff just by going on tumblr. Kids these days. No idea how great they have it. I gained a lot of color knowledge from CCAD though as well, at least I hope, a very professional work ethic. Also I met my wife there, so that was pretty nice. Ancient Egypt in space!? 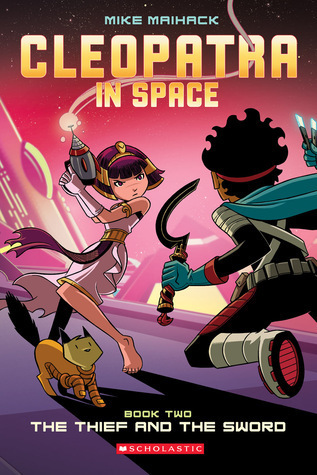 Holy cow, what a fantastic idea and great execution on your book, "Cleopatra in Space." Where the heck did the idea come from? It's kind of, as Hollywood would say, a “high-concept idea,” and so speaking of Hollywood any plans to develop it into a cartoon or film? Cleopatra in Space was originally just a single illustration, a concept I created for an online art group called DrawerGeeks. I enjoy putting all sorts of things in space: Cats, dragons, boots, washing machines, historical celebrities… So after six or so years of working on my previous webcomic, Cow & Buffalo, which was essentially just a couple of bovines arguing with each other, Cleopatra was a means to strengthen my skills as a cartoonist. I wanted to see what I could do with a longer form of storytelling with plenty of action. And humans. And cats. And that’s kinda where it was born. As for it ever being a cartoon or something, I guess we’ll see. I personally think it would make a better animated series than a movie. Right now though I’m just focused on trying to make the graphic novels entertaining. 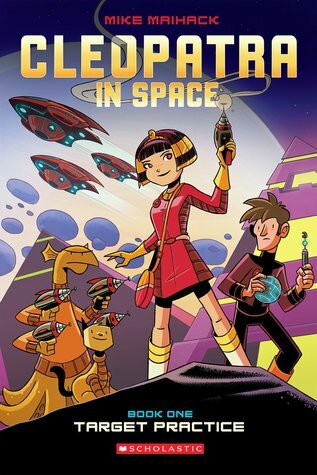 We understand from your blog, you're working on book 3 of "Cleopatra in Space." Did you have the whole series plotted out when you began? How much of the story are you figuring out as you go? Yeah the story is pretty much plotted out. There’s plenty of room in my outline to explore things along the way but I know where the characters need to go. I know what happens to them in the end. Essentially what I did when I sat down to chart out Cleopatra in Space as a series was create one giant story. Then I chopped that in thirds. Then I chopped the first third into more thirds and that’s essentially the first three books. I’m kinda obsessed with the number three I guess. Do you have a plan for what you'll work on after Cleopatra? Another series perhaps? There are quite a few ideas that have been percolating around in my head. I don’t know if any of them are good—or if I’ll even have interest in them when I’m done with Cleopatra in Space—but hopefully one of them will take hold. What I’d like to do is take the time to write one large, immersive novel—something over 300 pages—maybe a mystery—but I don’t think I’m capable of that yet. Cleopatra is my practice run. My iPad, a glass of water, a seven inch high stack of superhero comics, Neil Gaiman’s The Ocean at the End of the Lane, and a cat.